This is one of my favorite dishes. It’s super easy to make, healthy and tastes absolutely awesome. – throw all of the other ingredients into a magic bullet/blender and process into a paste. – once cooked cut into finger sized slices and top with sweet chilli sauce. 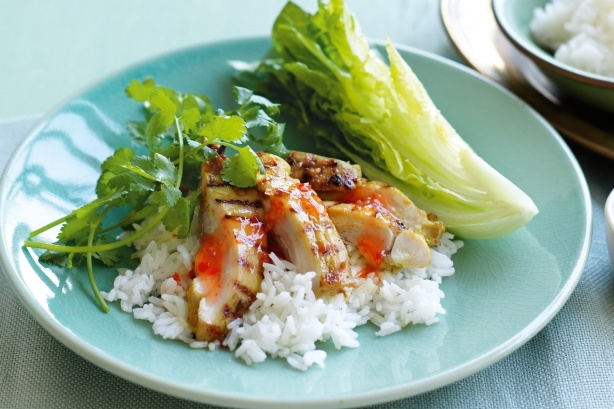 I like to serve it with a side of jasmine or basmati rice, some baby cos lettuce cut into quarter wedges and perhaps some cherry tomatoes and cucumber. Garnish with coriander leaves. Thanks Margaret! Every time I make this dish I always wonder to myself why I don’t make it more often? Hope that you enjoy it.